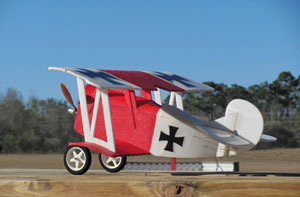 Our version of the famous Fokker D.VII is in cartoon scale with a 24 inch wingspan. 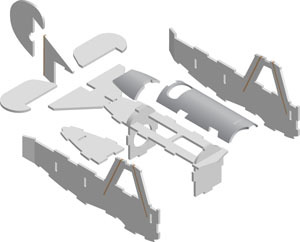 We use standard build methods consisting of a crutch and formers, but with the addition of tabs and slots so that every piece fits exactly where it is supposed to fit. 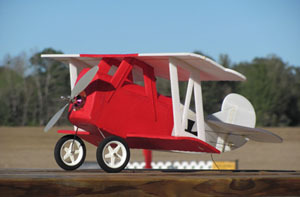 Our kits build fast so you can get into the air. Wing span - 24 inches. Model weight - approximately 150 grams (no electrics, no paint). Flight weight - approximately 475 grams (differs based on electric components). Build time - approximately 4 to 8 hours. Foam - 6mm polystyrene foam, precision computer-cut. Wood - 1/8" x 1/4" basswood (for spar and stiffeners), 3/32" plywood (pre-cut firewall). Motor - 370 to 400 size brushless. Servos - 3 (2 for elevons and 1 for rudder). Battery - 3 cell, 1000 to 1500 mah. Propeller - 8 to 9 inch. Adhesive - user preference (make sure it is foam safe). 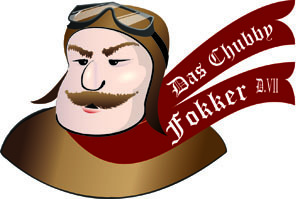 The Fokker D.VII is a fun cartoon airplane that looks and flies great. It is definitely a crowd pleaser.